Bishop Mark Edwards, Australian Catholic Bishops Delegate for Youth and an MC at the national gathering said, ‘The years of preparation leading up to World Youth Day 2008 (WYD08) and its events have changed the landscape of youth ministry leaving a lasting impression on the Church. Local youth ministries have grown and diversified. The number of youth ministers has increased along with diocesan support structures. Speaking during a press conference after the gathering, Malcolm Hart, Director of the Australian Catholic Bishops, Office for Youth, said, ‘the Year of Youth utilises the anniversary of WYD08 to highlight the impact a concerted effort and focus on young people can have in the life of the Church’. 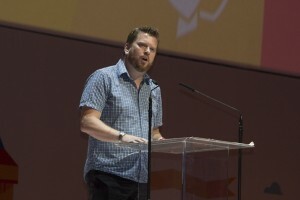 ‘The Australian bishops have established a three year cycle of events to support and sustain youth ministry into the future, this includes: support and participation in World Youth Day’s, the engagement of a new generation of young Catholics through the Australian Catholic Youth Festival and increased training and formation of those working with young people through the Australian Catholic Youth Ministry Convention,’ Hart explained. 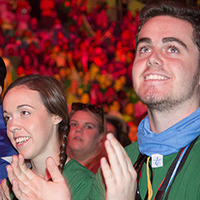 Following WYD08, the bishops established the Australian Catholic Youth Council, as a strategic advisory body, and created an Office for Youth to implement the Australian bishops vision for youth ministry, Anointed and Sent. ‘The challenge for a World Youth Day host city is how to make the event fruitful 10 years on. Australia could well be one of the countries that has leveraged World Youth Day in their own country to the greatest potential,’ Bishop Edwards said. Half of all Australian Catholic Bishops attended the gathering with special guest His Excellency Paul Wojciechowski, the Australian Ambassador to Poland. Hosted at the Mercy Centre in Tauron Arena, Krakow, the theme of the two-hour gathering was ‘Blessed are the Merciful’ with music, catechesis and testimonials reflecting this theme. Highlights of the Australian gathering included an inspiring call to action from Bishop Comensoli, an insight into ‘Polish and Australian Spirituality’ by Bishop Columba Macbeth-Green, an inviting homily preached by Bishop Patrick O’Regan and music by Victorian Priest, Fr Rob Galea. Prayers of the faithful were said in five different languages representing the multi-cultural nature of the Church in Australia. Bishops Edwards concluded that, ‘during the Year of Youth, it is crucial the Church engages with young people as a priority and re-affirms and sustains its work with them in the spirit of WYD08’.